As homeowners, one of the most rewarding, yet challenging, experiences we can go through is remodeling our house. Having dreams for a bigger closet or an extra room is exciting to see come to life, and many people save for years to see their vision realized. If you want to make some changes to your abode, but don’t have the thousands of dollars you need, you can still make improvements that won’t break the bank. 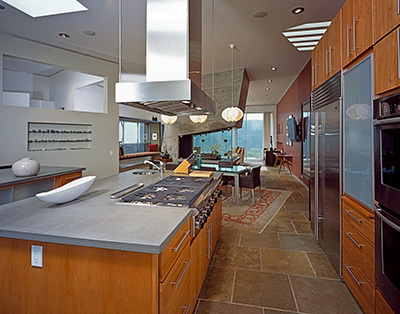 If you are planning a Los Angeles remodeling job, Busch Design Build, Inc. urges you to check out options to make your house more eco-friendly. Below are five easy steps to a Los Angeles green remodel that will improve the look of your house without costing you much money. 1. Change Your Lights – Are you eating under the same light fixture that came with your house in 1980? Or do you have to look at that chandelier you inherited from your grandmother every time you enter your living room? Why not purchase new light fixtures that will make your room, or your entire house, look more modern? You don’t have to spend a lot of money to purchase new lighting, and, in fact, you can usually save money in the long run. Whether you need outside lights, ceiling fixtures, or wall ones, you have the option to use more energy-efficient lightbulbs, such as fluorescent, LED, halogen or even solar. Since these green bulbs use less power and last longer, you will save money on your electricity bill, and will have to purchase light bulbs less often. For example, a compact fluorescent bulb (CFL), can last up to 10 times longer than a traditional one, and use up to 75% less electricity, according to Energy Star.Can’t you already picture your dining room with a modern new light fixture? 2. Repaint a Room – The biggest change you can make to any room is to paint it. Even if you keep all your furniture and don’t move a single thing, repainting will create a dramatic new look. Traditional paint, however, has toxic chemicals that you and your family will have to breathe, so as part of your Los Angeles green remodel, purchase no-VOC paint, which has less than 5 grams per liter, or low-VOC paint, which will have no more than 50 grams per liter. VOCs stands for volatile organic compounds, and are chemicals that evaporate at room temperature, causing health concerns, like breathing issues and skin eruptions. Purchasing chemical-free paint will be better for you and for the environment. Plus, it’s inexpensive to paint a room, you can buy a gallon of paint for under $100. 3. Reface Kitchen Cabinets – Do you dream of a new kitchen? If so, giving your kitchen a new look doesn’t require spending thousands of dollars. You can change your kitchen cabinets the green way, but using the ones you already have. This will help the environment because you will not produce waste by throwing out your old cabinets, and will not cause new trees to be cut down for new ones. Your local Los Angeles construction company can quickly help you, or you can attempt to do it yourself. All you need to do is reface, repaint and replace the hardware. To reface a cabinet, you just need to glue a new wood veneer to the doors to create a brand new look. Use Forest Stewardship Council (FSC) certified veneer, where the wood is certified that the wood you are using was harvested responsibly. Tired of traditional white kitchen cabinets? Why not give your kitchen some color with a bright new look? Repainting kitchen cabinets is an easy and fast way to a Los Angeles green remodel. Just remember to use no-VOC or low-VOC paint as we discussed above to minimize the amount of chemicals in paint. As for replacing the hardware, we just mean purchasing new handles for the cabinets. It’s amazing how spending $20-50 on new handles can really transform the look of your kitchen, and make it more modern. 4. Install Water-Saving Features – As part of your Los Angeles green remodel, you may want to update your bathroom. If you want to replace your shower heads, faucets or toilets, look into purchasing energy efficient ones that will save you money on your water bill, and help the environment. “Federal regulations mandate that new showerhead flow rates can’t exceed more than 2.5 gallons per minute (gpm) at a water pressure of 80 pounds per square inch (psi). New faucet flow rates can’t exceed 2.5 gpm at 80 psi or 2.2 gpm at 60 psi. You can purchase some quality, low-flow fixtures for around $10 to $20 a piece and achieve water savings of 25%–60%,” according to the Department of Energy. Additionally, installing high-efficient toilets that flush once for liquid waste and twice for solid waste will not only improve the look of your bathroom with new models, but will also help to save water. 5. Purchase Plants – Rather then spending money on statues or decorative vases, why not decorate your space with plants during your Los Angeles green remodel? Indoor plants are not only incredibly affordable, but they also give a room color. There are plants that actually clean your indoor air; Mother Nature Network lists 15 of them, some of which are: Aloe Vera, the Spider Plant, Gerber Daisies, Chrysanthemum, the Weeping Fig, etc.